How to Convert DivX to DVD? How to Convert and Burn SD Card to DVD? You just have some DivX/XviD files at hand, and yet you just want to play them on some standalone media player like DVD. Yet the event in your digital life just go by contraries. You’re just racking your brains to find a way to burn DivX to DVD easily. And you’ve tried many ways to complete the task, and the result is nothing. Luckily, here you could be able to convert DivX to DVD with the fast conversion speed. Just go on reading the article below to get more useful information. You could learn the guide on how to convert DivX to DVD with the high quality. Part 1. What is Divx? DivX is such one kind of video codec that is developed by DivX, LLC. The distinguishing feature of DivX codec could be its powerful ability to compress lengthy video segments into small sizes while keeping comparatively high visual quality. DivX could be such one kind of digital video format that could support MPEG-4, H.264 and the newest H.265 standard video. DivX could be another video encoding standard deriving from MPEG-4 video format. What we have called DivX, is the DVD rip video format. Generally speaking. DivX is actually 3 things. DivX is a set of digital video standards and file formats. DivX is software for Mac, PC, iOS and Android. 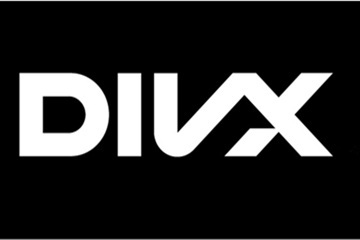 DivX is also a logo on certified, consumer electronics. Together, DivX is an ecosystem of digital video compatibility. As an ecosystem of digital video compatibility. DivX solves one of the most common problems consumers face with digital media. Suppose you have a Digital Still Camera (DSC) like the popular Canon PowerShot ELPH, some PowerShots record video in MPEG-4 Simple Profile while some use H.264. It varies. Now suppose you have a TV with an SD memory card slot or a DVD player in your car with a USB port. Now is where DivX comes to use. DivX offers free software for Mac/PC that will play those videos from your camera and more importantly, convert those videos into a standard DivX format compatible with about 1 billion consumer electronics devices out there ranging from TVs to DVDs to cars. Look for a DivX logo on those devices to ensure that videos created by DivX software will playback reliably. DivX Device Registration is an optional process that can be done to enable your DivX Certified device (e.g. a DVD Player, Gaming Console, Mobile Phone or other Consumer Electronics product) to play back DivX VOD (Video-on-Demand) content that you have purchased or rented online. All DivX Certified devices are capable out-of-the-box to play (non-VOD) DivX videos burned to CD or DVD. If you have DivX files on your computer, for example, you can simply burn them to a blank disk and play them on your device without going through the registration process. And that’s one of the major reasons why we need to burn DivX to a DVD. Having enough knowledge on the DivX, now we shold start talking about how to convert and burn DivX videos to DVD. There are many DVD burning programs that you can choose from to burn DivX to DVD, but among all of the products, I will strongly recommend a powerful DVD and Blu-ray burning program to you. That is Leawo Blu-ray Creator. Leawo Blu-ray Creator is regarded as one of the most powerful DVD burning programs in recent years. It can help you to burn your reluctant files to a DVD or Blu-ray disc with customized features retained. 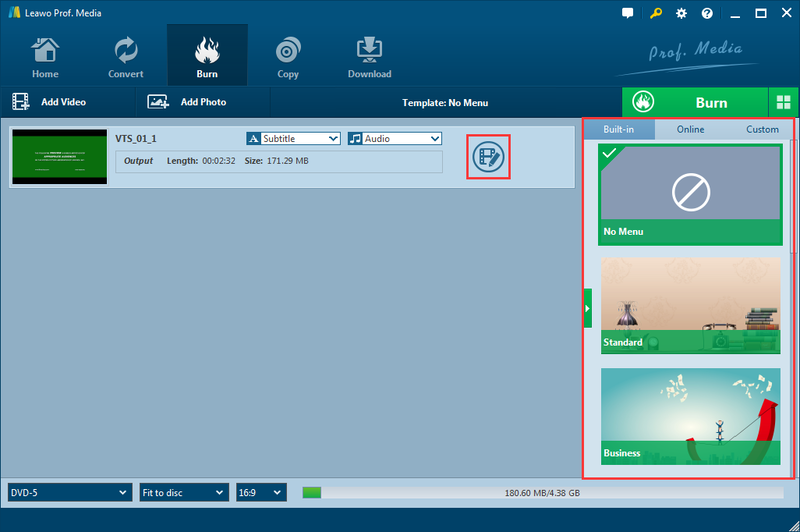 Leawo Blu-ray Creator is a professional DVD and Blu-ray burning program. It can easily burn all kinds of videos to a DVD or Blu-ray disc. The advanced burning technology within the software can allow you burn your video in a highest speed and preserve the original quality at the same time. Comparing to other similar products, the program is easy to use, and can deliver a stable performance when burning any video to a DVD disc or ISO files or folder. What’s more, the built-in video editor and menu maker makes it even more fascinating than any other DVD or Blu-ray burning programs out there on the market. The video editor allows you to trim, crop, add water mark, add 3D effect, remove noise and adjust special effects of the video. In the menu making wise, you can choose your desired menu template from built-in menu templates as well as online menu templates. All the elements in the menu page are customizable and you can even create your own template for future use. Now I’ll show you how to burn DivX video to a DVD with Leawo Blu-ray Creator. Step 1. Download Leawo Blu-ray Creator and run on your computer. Step 2. Insert a Blu-ray disc or a DVD disc. Step 3. Load the DivX video you would like to burn by clicking "Add Video" at the top of the main screen.You can also drag and drop the file into the main interface of the program. Step 4 (Optional). Leawo Blu-ray Creator provides some additional functions for you to burn a more personalized DVD disc. If you want to do some further edits to your video, click the edit button on the video, you can trim, crop, add special effects, add watermarks, or turn 2D video to 3D in the built-in video editor. 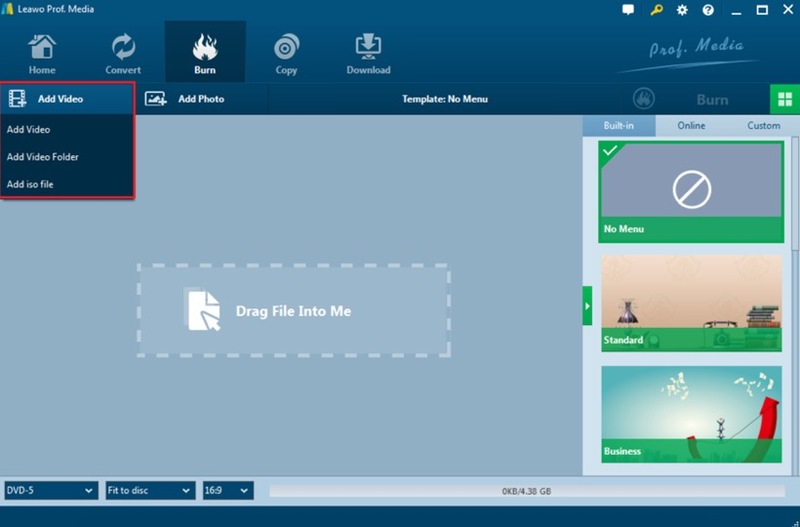 You can also create a DVD menu base on the beautiful DVD menu templates. Step 5. Start burning. When all the output settings have been set successfully, you can click green "Burn" icon and select the "Burn to", "Disc label" and "Save to" options, and then click the round "Burn" icon below to start the DivX DVD or Blu-ray disc burning. If you want to burn your DivX videos to a solid DVD disc, Leawo Blu-ray Creator is your best choice without a doubt. However, if you only want to try to burn the video to a DVD disc, not caring the quality, and don’t want to spend any money, there is another choice for you. Free DVD Video Burner writes prepared folders Video_TS from your PC (hard drive) to a DVD disc which can be played on all home DVD players. To burn DivX videos to a DVD with a DVD, you can try this free DVD burner program if you know how to make a structured DVD folder. Free DVD Video Burner contains no spyware or adware. It’s clearly free and absolutely safe to install and run, and it’s free. Now let’s see how to burn a DivX video to a DVD after you have converted it into a DVD folder with this free program. Step 1. Download Free DVD Video Burner. This is a clearly free program. There is no spyware or adware. It’s absolutely safe to install and to run. Step 2. Launch Free DVD Video Burner. Follow Start > All Programs > DVDVideoSoft > Programs > Free DVD Video Burner or just click the DVDVideoSoft Free Studio icon on the desktop. The interface is very simple and self-explaining. There is a field for input DVD video folder and the size bar which indicates occupied disc space. Step 3. Add DVD Video Folder to Burn. Click the Browse… button and select a VIDEO_TS folder you want to burn. The size bar below indicates occupied disc space. If you have more than one drive, select the one you need. Step 4: burning settings. There are some options you can set as you like. You can specify Disc title, change burning speed and temp files directory, set "Turn off computer if the process was finished successfully" and Disc ejecting function as well as function to remove DVD video after burning. Moreover you can choose file system: ISO9660, Joliet or UDF. Besides in the Options window you can change program’s language and check for updates. Step 5: Burn DivX video to DVD. Click the Burn button and wait a little. If you are using a DVD-RW disc and it already contains data, you will receive the following notification: "The disc contains data which will be erased. Continue?” Click "Yes" if you really want to rewrite the disc, click "No" to stop the burning process. Today we introduced two different DVD burning programs to burn your DivX videos to DVD. One is Leawo Blu-ray Creator, a professional DVD or Blu-ray burning program, the other is Free DVD Video burner. If you are still wondering which one to choose, take a look at the table below and I’m sure you will have a conclusion.